Infection occurs when a spore falls onto a leaf or stalk and produces a germ tube. The thread-like tube grows along the host surface until it finds an opening, usually entering through a natural pathway such as a microscopic air pore, called a stomate. 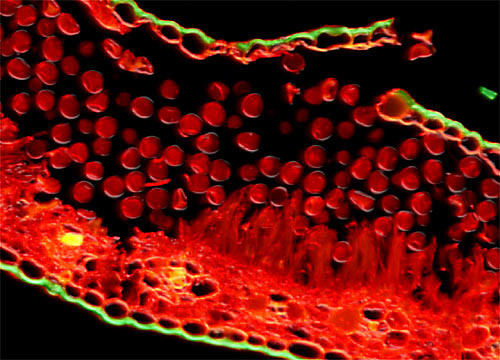 Branching out within the tissue, the tube forms a network of filaments and sends bulbous protrusions called haustoria to invade cells and absorb nutrients stored in the living cytoplasm. After a few days, the fungus reproduces by generating spores at the center of the infection site. The spore masses erupt through both sides of the leaf, producing visible brownish-red pustules that mature into the characteristic black spores of corn rust.